This post was originally published on Hello Jackson on October 14, 2013. One of the many reasons that I started Hello Jackson was to create a resource for people traveling through West Tennessee to find local businesses to support. One of the places that is already pretty popular with travelers is the I-40 Exit 87 BBQ Stand. It is a food truck-style establishment with a lot of character. Growing up, I always associated barbecue with family gatherings. Any time we all got together, we went somewhere to get some delicious pulled pork and all the sides. Exit 87 BBQ is exactly the kind of place we would go to pick up food for the whole family. They provide both custom catering options for events and individual servings for people stopping by the stand. They specialize in fresh hickory-smoked pulled pork barbecue that is sold by the sandwich, plate, pound, family pack, or whole shoulder. In addition to that Southern staple, they have St. Louis-style barbecue ribs by the slab, half slab, or plate; grilled chicken leg quarter plates; quarter-pound beef hot dogs, slaw dogs, chili dogs, and potato dogs (a hot dog stuffed with potato salad); quarter-inch-thick Krey bologna sandwiches; and whole hog pork sausage sandwiches that are awesome with a fried egg on top. They also serve nachos of all kinds: plain, barbecue, chicken, and chili-cheese. It seems to me that there is a little something for everyone! Owners Josh and Judy Wadley are committed to customer service in their business. When Josh acquired the business five years ago, they moved it to Exit 87 to cater to truck drivers. 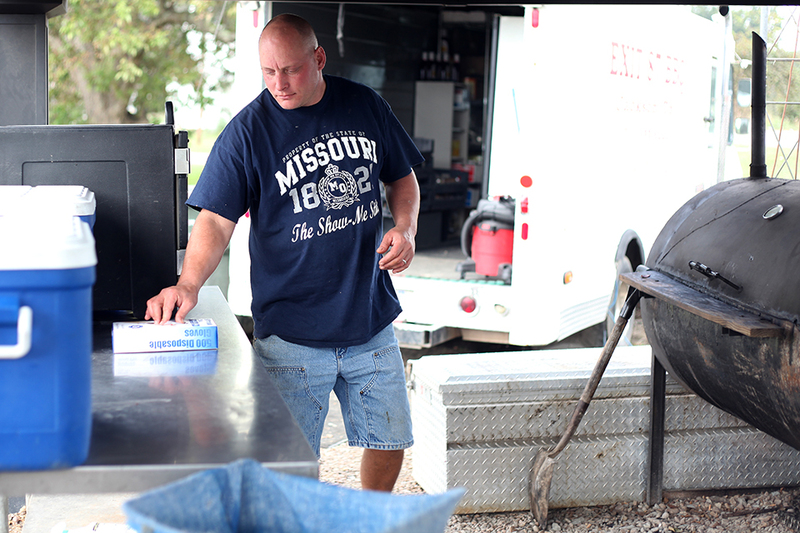 Over time it became popular with locals, and now he is cooking 300 pounds of meat each day and selling out by 6:00 P.M.. “Southern hospitality” is probably the best way to describe what you get from Exit 87 BBQ. Just from talking with Josh, I can tell they measure their success by how many people leave with a smile on their face each day. They truly just want to be around people, feed them delicious barbecue, and send them off with an excellent experience whether they are from Jackson or Seattle! I was impressed by how friendly everyone was when I visited the BBQ stand. Josh was great about welcoming each and every person and making them feel at home. Exit 87 BBQ creates a great experience with the delicious food and hospitality, customers spreading the word have become the most valuable advertisement. They’ve even had people from as far away as Canada stop by while traveling. Josh and Judy try to live by the values they were raised with and put a lot of emphasis on helping people. The employees they hire are treated as a member of the family, not just a worker. They also use their business to contribute to Jackson by holding fundraisers, such as a recent event for a local church where they raised over $1,200. I am always happy to support a business that sets aside time and resources to give back. Whether you are just driving through Jackson, or you’ve made your home here, stop by Exit 87 BBQ to experience quality food and customer service. Look for the little pig statue with the undies on, and you’ll know you’re in the right place! As the name suggests, Exit 87 BBQ is located right off I-40 at Exit 87 and is right across from Love’s Truck Stop. They are open seven days a week, but hours vary day to day. Find out more information on their Facebook page where they post lots of videos and photos.